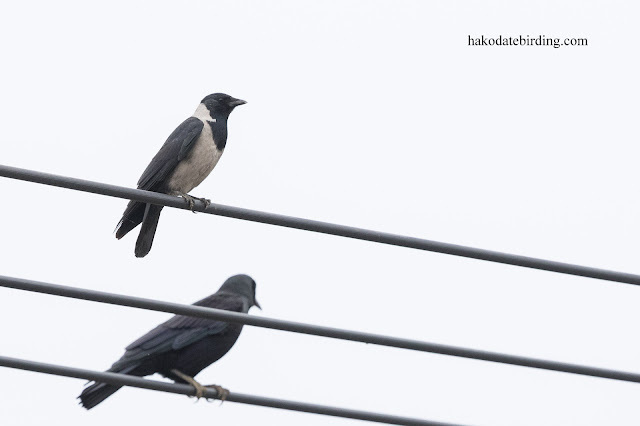 In late autumn the resident Carrion and Large Billed Crows are joined by 2 other species............Daurian Jackdaw and (Eastern) Rook. These are winter vistors from the Asian mainland and are much shyer than the resident species. There seem to be lot of the Jackdaws this year. About a dozen or so mixed in with the Rooks. The above crappy photo shows a grey phase adult with a Rook underneath. Hi Margaret, actually it was raining! Jackdaws are thriving here too, often at the expense of other hole dwellers. I've heard of them evicting Little Owls for instance. Lovely contrast in these two corvids.